The C160 Strap Patio Chaise Lounge is our best selling commercial strap chaise lounge! The C160 Strap Patio Chaise Lounge has a high 16-inch seat height, similar to that of a dining chair, which makes it easy for people of all abilities to access. Like all of our commercial grade pool furniture, the C160 Strap Patio Chaise Lounge is constructed from locally-sourced, extruded aluminum, which is sandblasted and powder-coated for a superior finish. 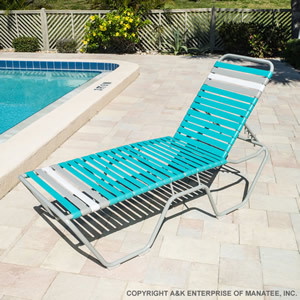 The C160 Strap Patio Chaise Lounge is made in the USA, stacks easily, has support bracing, features an adjustable headrest, and can be customized with a large selection of frame and strap color options!